Digital content is a file or information stored or published in a digital format. Digital content can be in many forms, from text and audio and video files, to graphics, animation, and images. Digital content creation software helps in authoring, publishing, and distributing digital content. The market for digital content creation is estimated to grow to US$ 43,237.7 Mn by 2026, recording a CAGR of 16.8%.The extensive use of social media such as Twitter, LinkedIn, and others has created an enormous demand for digital content. Furthermore, with advent of virtual reality and artificial intelligence, there is sudden increase in demand for digital content creation tools. The digital content creation market is driven by the increasing emphasis of enterprises on customer engagement and relevant advertisement through means of the internet. This in turn is boosting the digital content creation sector globally. Furthermore, the growing marketing budget of enterprises is boosting the growth of the digital content creation market.The global digital content creation market is anticipated to grow prominently during the forecast period due to the rapidly growing demand for social media marketing. By implementing digital content creation tools, enterprises are enhancing sales and promoting their brands. Furthermore, the education sector is flourishing due to the use of digital content creation tools. However, huge availability of free content creation tools is affecting the large-scale use of digital content creation tools. Furthermore, certain governments have imposed laws pertaining to the digital content released in the light of various privacy issues. Thus, the usage of digital content tools in these countries is restricted, which is limiting the growth of the market. A key trend boosting market growth is the increasing deployment of SaaS or cloud model. The technology is attracting a huge customer base due to its cost-effectiveness, scalability, flexibility, and massive processing power. Furthermore, changing content creation processes are also changing the way digital content creation tools are being used. The digital content creation market is segmented on the basis ofcomponent, deployment type, enterprise size, content format, and end-use industry. Based on component, the market is segmented into tools and services. Tools can be further segmented intocontent authoring, content transformation, and content publishing. Furthermore, services can be bifurcated into professional services, and managed services. Based on content format, the market is segmented into textual, graphical, video, and audio. In terms of enterprise size, the market is segmented into small & medium enterprises, and large enterprises. Further, the market on the basis of deployment type is segmented into cloud and on premise. In terms of end-use industry, the market is segmented into retail & e-commerce, government, automotive, education, healthcare & pharmaceutical, media & entertainment, travel & tourism, and others (manufacturing, utilities). Media & entertainment and retail industries are dependent on various end-to-end and on-demand content creation tools. This is attributable to the large amount of content required in these industries and the need to save time to develop original and error-free content. From a geographical standpoint, North America is expected to hold a major share in the digital content creation market. Growth in this region is attributed to strong adoption and penetration of digital content creation tools and services, as well as considerable application of digital content creation tools in different end-user segments across the region. Asia Pacific is expected to witness lucrative growth due to rising adoption of digital content creation tools in countries such as China, India, and Japan that are focused on developing strong internet infrastructure and digital technology which is providing huge opportunities to vendors present in the market. Furthermore, the markets in South America and Middle East & Africa (MEA) are also expected to grow prominently during the forecast period. Growing awareness and adoption of digital content creation across Middle East & Africa and South America is offering new opportunities for key players operating in the global digital content creation market. Major vendors are investing huge amounts in digital content creation tools since the market is expanding rapidly. Furthermore, underlying technological advancements and rising trend of digital content creation are encouraging the development of a wide-ranging suite of tools and services for different types of content. Moreover, prevailing software vendors are rapidly increasing their sales and distribution networks in order to reach the most distant customers. Key market players profiled in the digital content creation market report include Acrolinx GmbH, Adobe Systems Incorporated, Aptara Inc., Apple, Inc., Corel Corporation, Integra Software Services Pvt. Ltd., MarketMuse, Inc., Microsoft Corporation, Quark Software, Inc. and Trivantis. The digital content creation market report provides analysis for the period 2016 – 2026, wherein 2018 to 2026 is the forecast period and 2017 is the base year. The report covers all the major trends and technologies playing an influential role in the market’s growth over the forecast period. It also highlights the drivers, restraints, and opportunities for the analysis of market growth during the said period. The study provides a complete perspective on the evolution of the global digital content creation market throughout the above mentioned forecast period in terms of revenue (US$ Mn). The market overview section of the report demonstrates market dynamics such as the drivers, restraints, and opportunities that influence the current nature and future statusof this market, key indicators, end-user adoption analysis, and trends of the market. Further, key trends included in the report provide significance of the factors which are trending in the market. These trends are expected to define the market position during the forecast period and provide an overview about the global digital content creation market. A market attractiveness analysis has been provided for every segment in the report, in order to provide a thorough understanding of the overall scenario in the digital content creation market. The report also provides an overview of various strategies adopted by key players in the market. The report segments the market on the basis of components -Tools which includes content authoring, content transformation, and content publishing, and services which includes professional services, and managed services. Based on content format, the market is segmented into textual, graphical, video, and audio. In terms of enterprise size, the market is segmented into small & medium enterprises, and large enterprises. Further, on the basis of deployment, the market is segmented into cloud and on premise. In terms of end-use industry, the market is segmented into retail & e-commerce, government, automotive, healthcare & pharmaceutical, media & entertainment, education, travel & tourism, and others (manufacturing, utilities). The report provides in-depth segment analysis of the global digital content creation market, thereby providing valuable insights at the macro as well as micro levels. 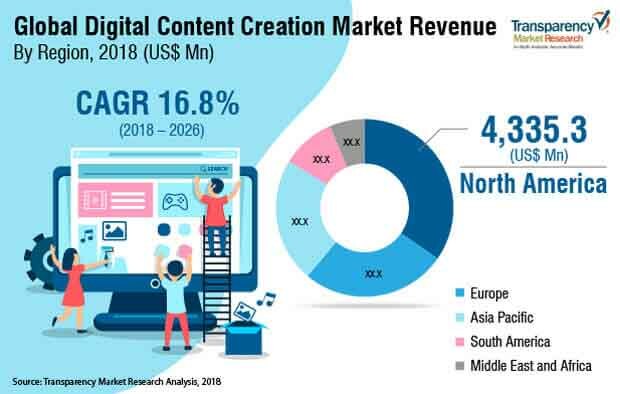 The report also highlights the competitive landscape of the global digital content creation market, positioning all the major players according to their presence in different regions of the world and recent key developments initiated by them in the market. The comprehensive digital content creation market estimates are the result of our in-depth secondary research, primary interviews, and in-house expert panel reviews. These market estimates have been analyzed by taking into account the impact of different political, social, economic, and technological factors along with the current market dynamics affecting the growth of the digital content creation market. This report provides all the essential information required to understand the key developments in the digital content creation market, and growth trends of each segment and region. It also includes companies’ strategies, financial information, and developments under the company profile section. Also, the report provides insights related to trends and their impact on the market. Furthermore, Porter’s Five Forces analysis explains the five forces, namely buyers bargaining power, suppliers bargaining power, threat of new entrants, threat of substitutes, and degree of competition in the digital content creation market. The report also provides a comprehensive ecosystem analysis for the digital content creation market. It explains the various participants including software & platform vendors, system integrators, and content creation platforms of the ecosystem in the market. The research methodology is a perfect combination of primary research, secondary research, and expert panel reviews. Secondary research sources such as annual reports, company websites, broker reports, financial reports, SEC filings and investor presentations, national government documents, internal and external proprietary databases, statistical databases, relevant patent and regulatory databases, market reports, government publications, statistical databases, World Bank database, and industry white papers are usuallyreferred. Primary research involves telephonic interviews, e-mail interactions, and face-to-face interviews for detailed and unbiased reviews on the digital content creationmarket,across geographies. Primary interviews are usually conducted on an ongoing basis with industry expertsand participants in order to get latest market insights and validate the existing data and analysis. Primary interviews offer firsthand information on important factors such as market trends, market size, competitive landscape, growth trends, and outlook, etc. These factors help to validate and strengthen secondary research findings and also help to develop the analysis team’s expertise and market understanding. Moreover, the data collected and analyzed from secondary and primary research is again discussed and examined by our expert panel. The research study includes profiles of leading companies operating in the global digital content creation market. Some of the key players profiled include Acrolinx GmbH, Adobe Systems Incorporated, Aptara Inc., Apple, Inc., Corel Corporation, Integra Software Services Pvt. Ltd., MarketMuse, Inc., Microsoft Corporation, Quark Software, Inc. and Trivantis.